Princess Cut Kite Set Pendant was added to your cart. 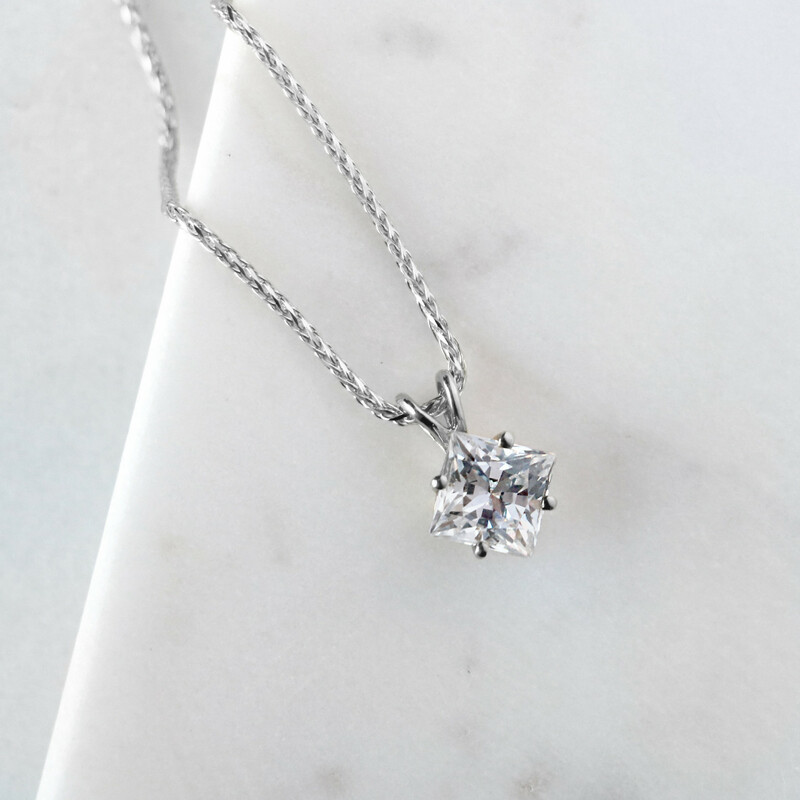 This solitaire pendant makes a style statement. 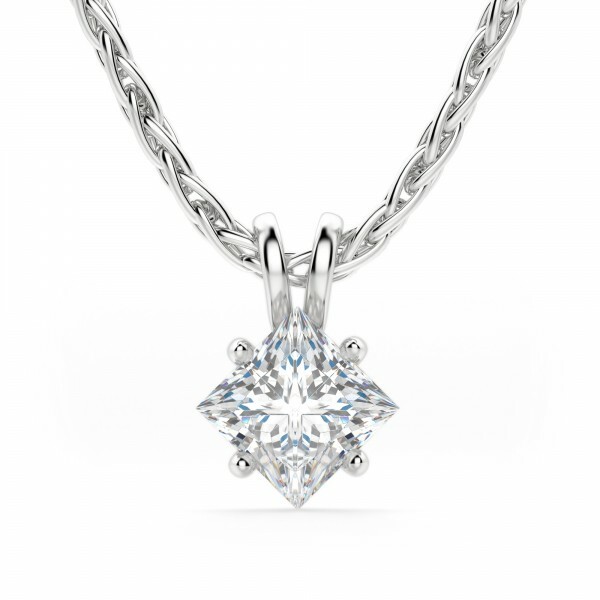 The Princess cut Nexus Diamond alternative is set on an angle, making the most of the square corners. 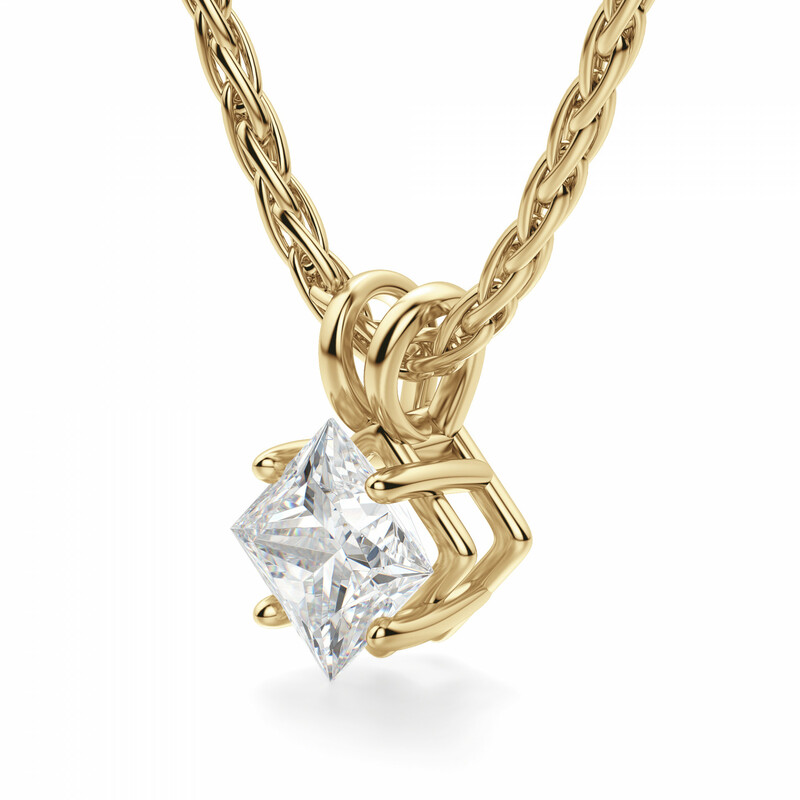 It is striking and graceful, and is a perfect choice no matter where it is worn. Bought these for my granddaughters for Christmas to introduce them to what to look for in quality jewelry. Cut and brilliance of the stones was excellent. 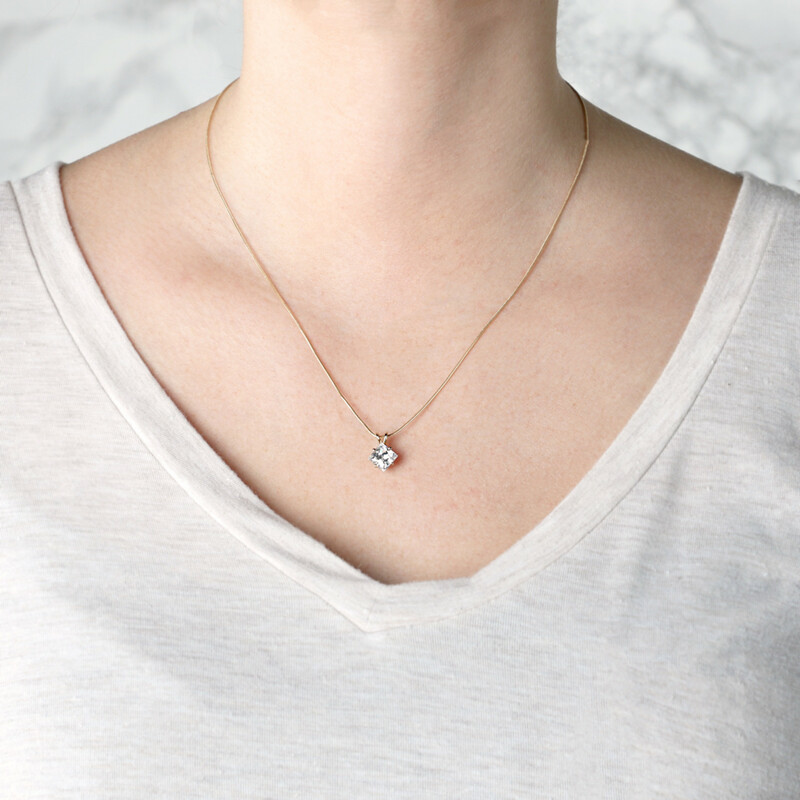 I purchased the smallest size of this pendant (.71 ct) as an accent piece for work attire. I also wanted something I could take on a business trip and not be too concerned if it "disappeared!" This fits the bill! Beautiful setting, perfect as an accent piece for a business dress suit, and small enough to be believable. Highly recommended! I got the 1.24 tcw...just the perfect size...looks like a real diamond...I also purchased this item as a trial before purchasing more expensive pieces...needless to say..I WILL be shopping for more! I am so pleased with my princess cut kit pendant. It is just the perfect compliment to any outfit I choose to wear it with. Order this - you won't be disappointed. Purchased a much larger stone than I otherwise have bought. Beautiful + lovely setting = Elegant. It is a beautiful pendant!!! I ordered this piece as a trial to see how I would like the product. Showed it to my wife and she LOVED it. Had to wear it right away. The next day she was on the website looking for more jewelry to order. I am already planning future purchases. I was extremely happy with the quality, color and brilliance of the stone and the setting. I gave this to my girlfriend, while we were on a cruise. She loved it. Made her cry, and she looked beautiful on formal night. Best pendant ever. Girlfriend loved this, I will shop here, again. Perfect blend of class and elegance! I bought the 5.62 TCW diamond for my mom because she always wanted a diamond but at a noticeable size. The red wooden box it came in already set the tone that it would be great -- and was it ever! It's very shine and elegant. I want one for myself! I would highly recommend this since it is the perfect combination of feminine, classy, and affordable! So I bought this as a Xmas gift and upon delivery the UPS truck that my package was on got robbed!!! This company worked with me and got another one to me before xmas by expediting the package for no extra fee. GREAT customer service. The girl was very nice and and gave me updates as often as she could as to whether they were going to be able to help me out or not. I finally got the package and it looks AMAZING. I went with the 1.24 so it would still be believable. I will def be getting here the matching earring for our anniversary. I bought the Venus last month for my sister. It was so pretty and it looks like the real thing. So I bought one for myself, around the same size, and I was disappointed about this one. It looks fake compare to my sister's one. Diamond Nexus responds: We are sorry that you were not pleased with your second purchase. We would like to hear more about why the purchase was not to your liking, if the stone size was similar to your last purchase which you were happy with. Please email our customer experience coordinator at Michelle.Edwards@diamondnexus.com with your order number and name on the account. Thank you for taking the time to post a review and please know that we will do everything we can to make this a positive experience for you and get a beautiful pendant on your neck to show off as soon as possible! If I remembered correctly, this earth angel pendant was probably my third item purchased from Diamondnexus. The sparkle of the stone and the craftsmanship were certainly of the highest level. I have bought a total of at least five pieces of jewellery from this site and I will continue to purchase from Diamondnexus. Thanks for being authentic hence giving your customers so much satisfaction from the quality jewellery that you offer. P/S could you describe the dimensions of the items in future and have option lengths for bracelets too? I have never bought any bracelet because none of your bracelets come in 6.5 inch. Diamond Nexus responds: Thank you for taking the time to post a review for your purchases! We truly appreciate your business and are very happy that you are so pleased with the jewelry you have received. As for bracelet lengths, some items can be semi-customized so it is best to contact us here at 1-800-509-4990 to ask about specific bracelets being sized. We are always happy to assist! Was not what I expected ! Looked Fake and was. 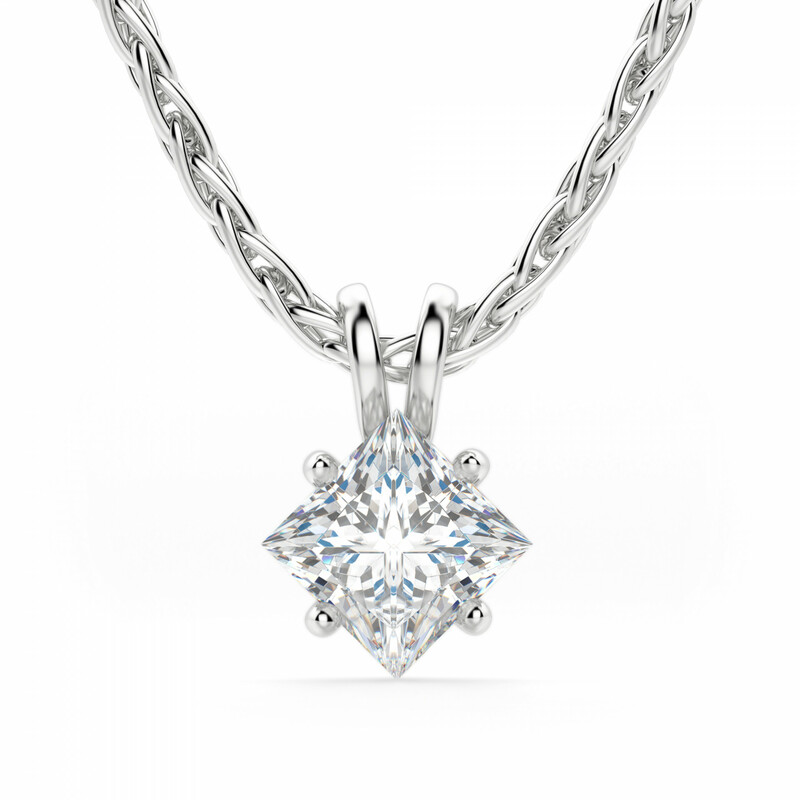 Diamond Nexus responds: We are sorry that you were not pleased with your pendant. We do want to thank you for giving our product a try and though it was not to your liking, we hope that you had an easy experience in returning and if there is ever anything we can do to help in the future, please let us know! Sometimes, ordering items with stone sizes that are more comfortable wearing will be more believable, depending on the person and what their style is. Got this beauty last month and still love its enticing sparkle and the fact that its man made, I love the peace of mind with all of your products!! This is my second time buying from Diamond Nexus and with each experience the diamonds look better and better. I received this for my birthday and I absolutely LOVE it!!!! I love the unique shape of the pendant and it sparkles better than the real thing! I will never buy mined diamonds again!!!! I purchased this pendant with a 4.12 center stone a few months ago and words cannot describe how beautiful it truely is. I put a lot of thought into which size stone I should buy as I like bold, noticable jewlery, and this piece certainly fits that description without being too gaudy. In fact, 4.12 carats in a princess cut on a short singapore chain seems to be the PERFECT size! I recieve so many compliments on this pendant no matter where I go. Nobody even questions if it's real. I wear it as an everyday piece in the office or for a night out, it's simple enough to be appropriate for any occasion, and yet it really adds quite a "bang" to your look. It's so bright and sparkly, I cant help but admire it every time I look in the mirror! I was wearing this for a bridal shower one day... you should see the way this baby jumps out, even in pictures! Got this for my sister for her birthday and opened it when it arrived!!! I couldn't believe how breath taking the stone was!!!! I showed it to my partner who was so impressed he got me an engagement ring from you guys!!!! She looked the pendent and wears it everyday!!!! Thank you !!!! Birthday and christmas shopping is so much easier now!!! I've had this necklace for some time and really enjoy it. It is delicate and very nice to wear anywhere! My husband purchased this as a Christmas gift. I love the princess cut! The necklace works for day or night wear and always looks flawless! Got it for my girlfriend and she wont take it off. This was my first purchase from the DNL and I will continue to buy from them! Great jewelry at great prices! I just received it and i fell in love with it!!! its absolutely beautiful it shines like never before!!! i compared it to my 1/2 a carat princess cut solitare mine diamond and i couldnt tell the difference!! im looking forward to buy the ciderella staircase set. 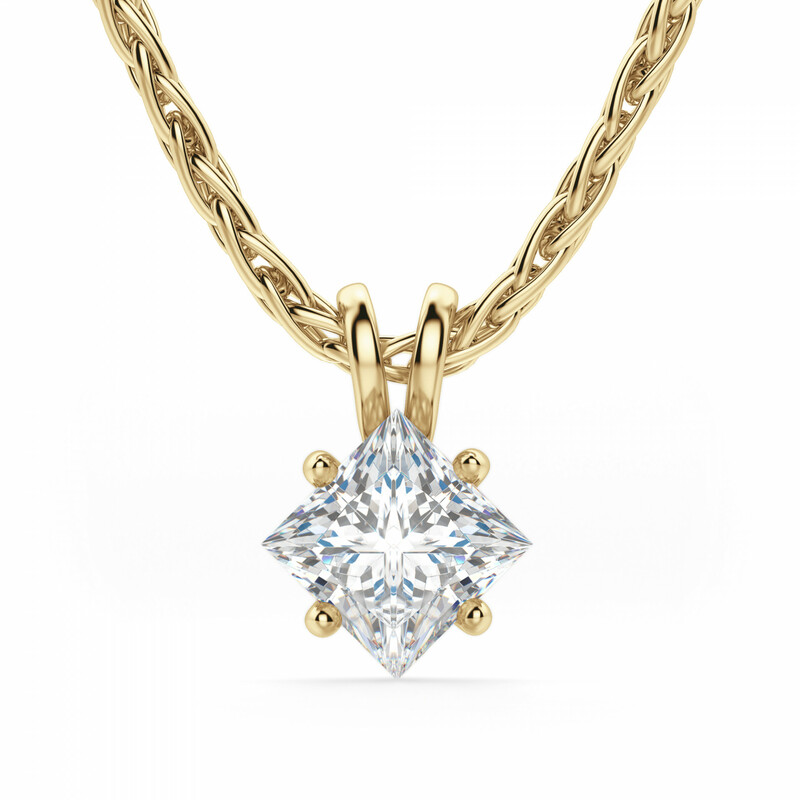 I recently purchased a 1.96tcw earth angel pendant and I am delighted with stunning beauty of this pendant. I wear it every day and get many many comments on its beauty. A quick wipe with a soft cloth every morning is all it takes to keep this stunner sparkling. I would highly recommend buying this product. I am exceedingly pleased. I love my princess cut solitaire, I wear it all the time with my matching earrings ,it is just georgeous. Thank yuo so much diamonds Nexus, you may possible to have some diamonds. Truly looks and acts like real diamond. 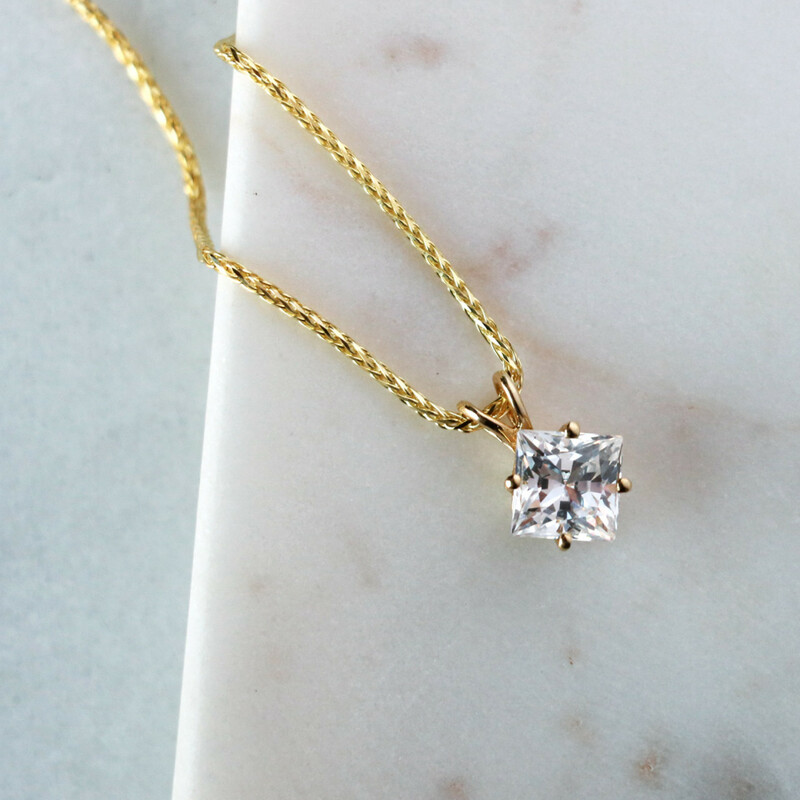 A beautiful pendant that gets complements all the time. My wife loves to wear it! A beautiful piece of jewelry. I would like to thank you for the beautiful pendant that your store has to offer. When I received it in the mail and open the box I was so taken back, OH MY GOSH it is absoltely GEORGEOUS!!! I love it and I get comments on it ALL THE TIME. Thank you for the great items you have to offer.